Lua error in Module:Location_map at line 488: Unable to find the specified location map definition: "Module:Location map/data/USA North Dakota" does not exist. Bismarck is the capital city of the U.S. state of North Dakota. 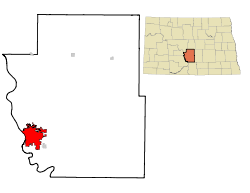 It is also the county seat of Burleigh County. As of the census held in the year 2010, its population was 61,272. The population of its metropolitan area was 108,779. Bismarck was founded in 1872. It has been North Dakota's capital since it gained statehood in 1889. Bismarck is situated on the east bank of the Missouri River, directly across the river from Mandan. The two cities make up the core of the Bismarck-Mandan Metropolitan Statistical Area. 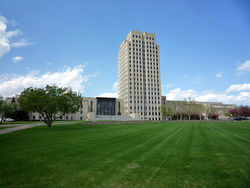 The North Dakota State Capitol, the tallest building in the state, towers over the central part of Bismarck. The state government employs more than 4,000 in the city. As a hub of retail and health care, Bismarck is the economic center of a large portion of south-central North Dakota and north-central South Dakota. ↑ "US Board on Geographic Names". United States Geological Survey. 2007-10-25. Archived from the original on 2012-02-26. Retrieved 2008-01-31. ↑ "Bismarck (city) Quick Facts from the U.S. Census Bureau". Retrieved November 26, 2011. ↑ "Metropolitan and micropolitan statistical area population and estimated components of change: April 1, 2000 to July 1, 2009".